Are there any health benefits that come from air duct cleaning? Heating, Ventilation, and Air Conditioning (HVAC) air ducts have been shown to act as a collection source for a variety of contaminants that have the potential to affect health, such as mold, fungi, bacteria, and very small particles of dust. The removal of such contaminants from the HVAC air ducts and home should be considered as one component in an overall plan to improve indoor air quality. -Pets that shed high amounts of hair and dander. 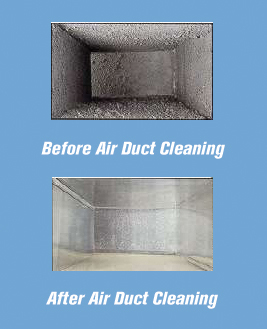 -Water contamination or damage to the home or HVAC air ducts. -Residents with allergies or asthma who might benefit from a reduction in the amount of indoor air pollutants in the home’s HVAC air ducts. -After home renovations or remodeling.